Welcome to the Litfuse blog tour for Shadowed by Grace by Cara C. Putman! I think I've read almost every Christian fiction book that has been set WWII. I really love the intrigue, emotion, and history of that era. However, the story of priceless art that disappeared during Hitler's reign is fairly new to me after reading Tricia Goyer and Mike Yorkey's book a few years ago, Chasing Mona Lisa (I guess I did see a Hogan's Heroes rerun that involved some stolen art...but, um, although enjoyable, I haven't based much of my WWII history on that sitcom). Anyway, I was excited to read Shadowed by Grace, which dealt with the 'Monuments Men,' men who were given the task of recovering and protecting Europe's invaluable art. Yes, there was excitement and intrigue...but, not enough to keep me glued to the pages. I had a hard time liking Rachel from the start – her mom seemed too sick to leave, no matter the good intentions of getting help that seemed absolutely impossible in such a time and place as war-torn Italy! Sure, it's fiction, but still...running off to battlefields in Europe hoping to find a no-name man... Well, it made me question Rachel's sanity. And the romance wasn't really there for me, either. Yes, long courtships aren't realistic during wartime, but I just didn't feel much of a spark between Rachel and Scott. And Tyler was just unexpectedly crazy! Ok, honestly, the story wasn't that bad! 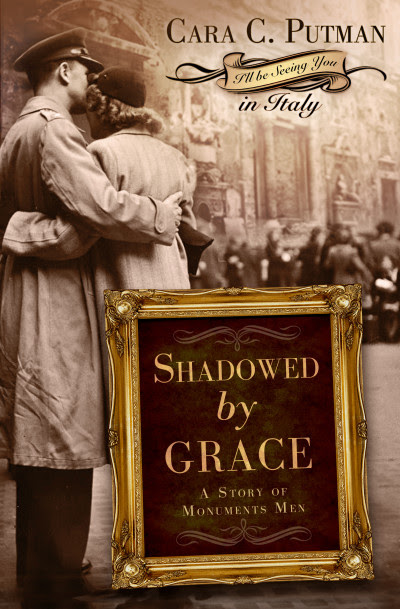 If you are enthusiastic for WWII fiction, you'll likely enjoy the tidbits of history and style in Shadowed by Grace. For me, though, it was a 3-star kind of book: a good 'one-time' read, but not one I'd stay up until midnight to finish or keep on my shelf to read again. Thank you to Cara and B&H Publishing through Litfuse for sending me a copy to read and review!